Here’s what you should know. The ab rocket won’t project you into the gym’s wall nor will it work like any other ab workout device you’ve encountered. 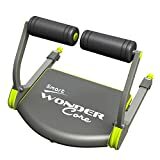 It’s truly unique in the way it manages the intensity and comfort level of abdominal workouts. There’s a difference between getting strong abs and having a well-defined 6-pack. Knowing what both mean and what you want to achieve is the first step in developing an efficient workout routine. Unlike other muscle groups, the abdominal muscles work almost all day long. They’re used to constant stress which means they are better equipped to recover between intense workouts.